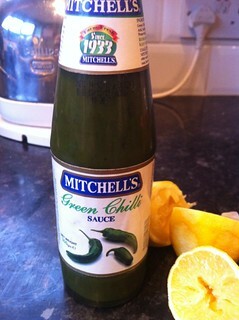 I love chilli sauces and have a huge collection, but for some reason this one has been in my cupboard for ever. I bought it in a large Pakistani supermarket in Birmingham but was never really sure what to use it on. It’s not like Mexican green chilli salsas or sauces at all. VeganMoFo forced me to get it out and use it and I’m glad I did. It has a lovely heat level, quite spicy and sour, and went perfectly in my dish. I used some frozen parathas which I always keep in my freezer as the base. 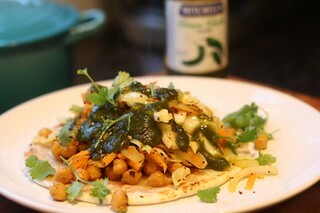 Then I cooked chickpeas, using the fabulous recipe from the Chickpea Shawarmas in Vegan Sandwiches Save the Day. I topped them with shredded cabbage and carrot cooked in coconut oil with mustard seeds and chilli. Finally I used some of the chilli sauce on top. They looked a bit like an Indian version of a taco and they were delicious! Have you tried green chilli sauce? What did you think? I’ve never tried green chili sauce, but it must be very tasty in this yummy-looking dish. Very interesting…I haven’t tried it. Looks good, though!